Green beach was a potential trap, yet all but a single assault battalion landed on it between the cliff wall to the left and a barren rock formation to the right. In nine hours 20,000 troops scrambled ashore there he entire strength of an infantry division, reinforced by heavy artillery and shore engineers, tank and tank destroyer battalions, signal and quartermaster attachments-all were landed in an area less than 250 yards long and fifty yards deep. On this one beach rested the success of the Divisions invasion, and across it was put every vehicle, every gun, all the tons of supplies. One year later, August 15, 1945, men of the Division gathered on this same Green Beach with French and American officials in a ceremony to mark the inauguration of a monument memorializing the D-Day landings in Southern France. Simultaneously, the 36th dedicated its own temporary memorial, a small bronze plaque. Barrage balloons were quickly elevated and onpouring traffic was rushed over Green's single road. Tanks and tank destroyers jarred ashore. They came in early and lost no time going into action. Pebbles, rocks and boulders of all sizes were strewn over the shores of Green Beach. In conjunction with debarking infantrymen, burly bulldozers chugged out onto the beach to plow under the larger rock formations and to prepare an exit to the main coastal road. 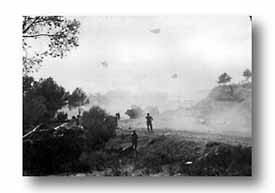 Tanks and tank destroyers followed closely behind, clambering over Green Beachs back-dropping irregular slope and granite quarry. The cumbersome tanks were unloaded with astonishing facility. 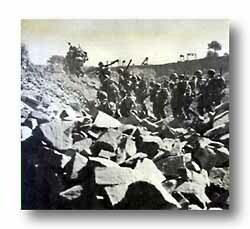 Supporting armor grumbled loudly as it rolled off the beaches to pave the way for an offensive. Ambulances came in early, ready to pick up casualties and return them to the waiting vessels.